This post is another renegade edition, could not find the official Tall Paul posting, not sure if it ever was created. However this day needs to be remembered as some of the all-time great A*T’s. Not for amazing international, or cutting edge shredding jammers. This day brought out a real plethora of names from the history books of Frisbee. It started as word got around that Kerry Kolmar was coming back to his old stomping grounds of Central Park. For those who may not know their history, Kerry was the top freestyler in the mid 70’s and invented the nail delay (another long story that can be related later). Personally speaking, Kerry was a main reason I fell in love with the sport. I had been delaying and doing tricks for a few months, when I was in Central Park and first saw Kerry jamming. He had it all, skills, style and flow. I was bitten and have not looked back. While most of the American players could be called “Old-Timers” now, much of those out on this Thursday were active during the early and mid 70’s, when modern Freestyle really started. Stars from that day who are not as active freestyling today included Kerry Kolmar, Mark Dana, Tony Furman, Dave Marin (did not stick around for the photo), Krae Van Sickle and Gerry Lynas. 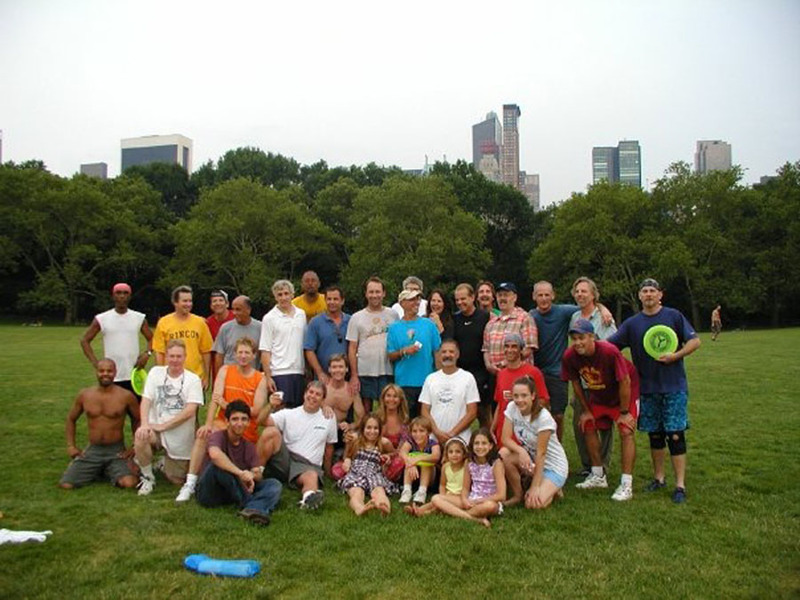 The regular attendees included Joey Hudoklin, an all-star from that period who continues to amaze us local every time he touches the disc as well as the ageless Trevor Brown who I think was jamming in the 1800’s. The rest of the crusty crew included myself (Roger Meier), Dougie Simon, Richie Reganburg, Tall Paul Mondesire, John Burke, Gary Auerbach, Lou Sumrall, Rob Fried, Ted Oberhaus, Chris Kohn, Quinn O’Neill and Brad Keller. I can not remember specific jams that day, but the vibe was incredible. These fellas really had style. Hoping we can reprise an “old-timers” day soon!